St. Joseph’s Hospital Health Center has a total of 310 refrigerators throughout the organization. These items require strict temperature ranges for quality patient care and safety. Regulatory agencies perform audits requiring logs of temperature monitoring and corrective actions. 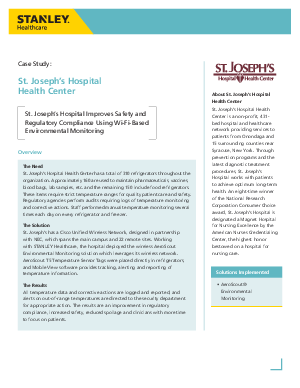 Read this case study to learn about how St. Joseph's deployed the wireless AeroScout Environmental Monitoring solution to leverage its wireless network by working with STANLEY Healthcare.